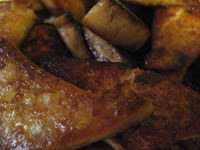 Ever since I discovered honey fried tofu earlier this year, I've been dreaming about trying the vegan version--Maple Fried Tofu. Before getting extremely sick earlier this month, I bought quite a few tubs of 365 Organic brand tofu at Whole Foods Market during a visit to my BF's house (Lucky b*stard lives so close to a Whole Foods, and he's an omnivore that rarely shops there. Grr.). I try to stock up when I visit him because the WF tofu is cheaper than I can find it at my local grocer. So, I stocked up, then got sick and the tofu is now drawing close to the expiration dates (well, end of the month)... so I'll be using it up over the next few weeks. One of the recipes I'm dying to try is the BBQ Pomegranate Tofu from the book, Vegan with a Vengeance. Holding me back has been the pomegranate molasses ingredient. BUT, I found it at Whole Foods this past weekend, so I'm ready to dive in and try this one SOON! But for now, it's been quick and easy cuz we're having a heatwave here in MI... heat indexes hovering at 100 degrees. Oi. Last thing I feel like doing, especially since I don't have central a/c, is to slave over a meal on a hot stove.